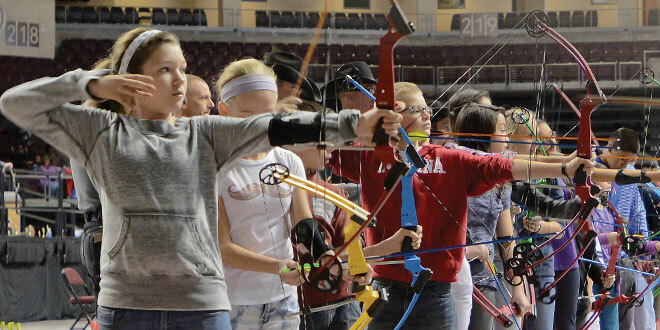 About 8 a.m. March 12, youths started arriving at the Albuquerque Convention Center in anticipation of the National Archery in Schools Program New Mexico State Championship Tournament. Arriving in waves, 829 participants representing 51 teams walked up to shooting lines for a chance to advance to nationals May 12-14 in Louisville, Ky. Although the national tournament might be icing on the cake, becoming a better archer was the primary goal for most of the participants. Emilee Wood, a 10th-grade participant for Aztec High School, had never competed at the state level, but reached nationals two years ago as a replacement. For her, good scores represent improvement, but visualizing the perfect shot is the reason to participate in the program. Chris Chism, a 9th-grader at Aztec High School, goes one step further. “Especially when you hear the arrow hit the other arrows because you know you’re grouping so well,” he said. Chism, involved in archery for a year and a member of the team for over a month at the time of the championships, finished 25th out of 453 participants in the boys category and 34th overall with a total score of 261 (of a possible 300). He said he relished his five consecutive bull’s-eyes from 10 meters. “I’ve gotten perfect scores, but not today, unfortunately,” Wood said. The Archery in Schools Program has grabbed the attention of many youths across the nation. Reasons for getting involved are varied. For Chism, it was watching Tim Wells’ “Relentless Pursuit” on television. “I pestered my dad for about six months and he finally broke down and got me a bow,” Chism said. “I thought it was pretty awesome watching it,” Wood said, adding that she and teammates will put a small piece of tape on a target and see if they can hit it, which came about after watching the Hunger Games trilogy. Sophie Walker, a fourth-grader, and Mario Roybal, a fifth-grader, both at Maggie Cordova Elementary School in Rio Rancho, had their own stories. Sophie Walker, a fourth-grader at Maggie Cordova Elementary, got involved in archery when her mother got tired of buying Nerf bows and arrows and got Sophie the real thing. Roybal got started after his friends told him how fun it was. He’s already got other aspirations of heading into the field. The stories the young archers tell of their involvement in the sport is the reason Mark Yoder, a physical education teacher at Coronado Elementary, wanted to bring archery into his program. Yoder has 24 members on the archery team, 22 on the club, and reaches another 100 through the physical education class. While Yoder defines success as being able to hit the target, his team is excelling at the sport. Coronado finished second behind Clovis Christian School by less than 100 points and the team managed 50 bull’s-eyes. Chism and Wood would like to see more interest. Increased participation would allow Aztec High School to compete as a team, which would require between 12-24 archers. From an individual perspective, however, Aztec was well represented with Cody Paris winning the overall tournament (289), Clint Valerio finishing in a tie for third, and Tyler Perry taking 27th. Mario Roybal, a fifth-grader at Maggie Cordova Elementary, said his goal is to become proficient enough to take his skill into the field for an archery hunt. NMDGF photos by Zen Mocarski. No matter what place individuals finished, Roybal summed up the competition as a means to improve. It might be somewhat fitting that a number of the highest scores at the National Archery in Schools Program’s New Mexico State Championship were turned in by those taking AIMS. That is, attending AIMS, the Albuquerque Institute of Mathematics and Science. Archers from the school took seven of the top 10 spots overall and the high school division team won and qualified for the national tournament in Louisville, Ky., while the middle school finished second. Jesse Saunders, second place, Vincent Romero, third, David Westphal, fifth, Lucas Chavez, seventh, Anne Rolsma, eighth (first overall in the girls category) and Aaron Lawrence, ninth, all finished in the top 10. Breaking the school’s stranglehold on the top 10 was Cody Paris, first overall from Aztec High School, Tyler Pierce, sixth, from Albuquerque Homeschool and Tyler Lingnau, 10th, from Clovis Christian School. James Monroe won the Middle School Division with 2,999 points. The top three middle school scores were turned in by Westphal, Chavez and Lawrence. In the Elementary School Division, Clovis Christian School finished first with a score of 2,857, with Coronado and Seven Bar elementary schools taking second and third, respectively. The top three elementary school scores were turned in by Kimber Barnett and Chloee Whitten, from Clovis Christian and Ben Anyanonu, from Seven Bar Elementary. The long-standing tradition of archery may provide a key to unlocking the potential of students and improve graduation rates in the process. Brian Guzman, archery coordinator for the New Mexico Department of Game and Fish, believes getting more students involved in the National Archery in Schools Program can help. He said it is possible participation will help keep youths enthusiastic, attentive and in school. “Of the students that drop out of school, 88 percent indicate they were not involved in extra-curricular activities,” Guzman said. “Educators have reported that the program has engaged the otherwise unengaged. It helps students achieve a higher level of self-confidence. 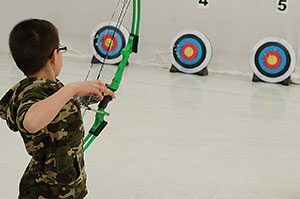 The archery program began in 2002 in Kentucky and the program quickly grew, reaching its three-year goal of 120 participating schools in its first year. The units of study were developed to meet state and national educational standards, meaning it could be easily integrated into the curriculum. The program is available for inclusion for grades 4-12 and is broken down into three divisions: elementary, middle and high School. 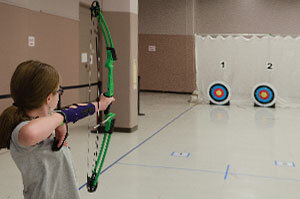 Each school participating must have a teacher or volunteer that has passed Basic Archery Instructor course. Guzman said schools wishing to join should contact him for more information at brian.guzman@state.nm.us or call (505) 231-4375.